Botswana is a land-locked country in South Africa bounded by Namibia to the West and North, South Africa to the South and East, and Zimbabwe to the North-East. Botswana has a total land area of just over 224,500 square miles and a population of around two million making it a very sparsely populated country at around 9 per square mile. After independence in 1966, the economy grew at an annual rate of around 9% transforming the country from one of the poorest to one among the wealthiest in Africa. Botswana’s per-capita GDP is around $7500 making it a solid middle-income country. Fiscal discipline and sound management is credited for this transformation. Diamond mining accounts for around one-third of the GDP. Service sector is the fastest growing industry and the other sectors include tourism, and agriculture. The low population count of the country has made Botswana an adventure tourist's utopia. Botswana is flat with around 70% covered by the Kalahari Desert. The other distinct landforms are: The Okavango Delta, Limpopo River Basin to the South-East, and the Makgadikgadi Pan, a large salt pan to the North. These distinct and diverse landforms are also the biggest attractions of the country. 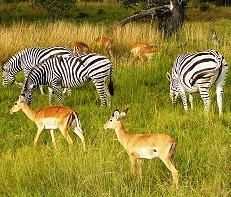 They support numerous wildlife including the endangered African wild dog and African elephants. The best time to travel to Botswana for wildlife viewing is the dry winter season (May to October) when the bush is at its thinnest and the animals at their thirstiest. For bird-watching and the Kalahari areas the summer rainy season (November to April) works best. Botswana – The Bradt Safari Guide – Okavango Delta, Chobe, Northern Kalahari 978-1841623085 $18 Great for both organized safari goers and those opting for independent self-drive. Excellent coverage of the region’s wildlife, environment, and history along with details on when, where and how to go. Accommodation options for all budgets. The author Chris McIntyre is a UK based tour operator. Whatever You Do, Don’t Run: True Tales of a Botswana Safari Guide 978-0762745654 $12 It is a hilarious read as the author Peter Allison recounts true tales from his thirteen years of experiences as a safari guide. The book should be required reading for all first-time safari goers. Cry of the Kalahari 978-0395647806 $11 A classic for animal lovers and travelers alike! It presents the experiences of the authors Mark and Delia Owens, who spent seven years in the Kalahari Desert studying wildlife. It is a layman’s introduction as opposed to a scientific account and that makes it ideal for the traveling masses. Botswana Travel Map 978-1845376093 $10 Highlights scenic routes and features detailed area maps and two town plans. A beautiful long bird set (Scott #19 to #32) released on January 3rd 1967. The set catalogs for around $60 MNH and about half that for Used. The birds depicted are European golden oriole, African hoopee, ground-scraper thrush, blue waxbill, secretary bird, yellow-billed hornbill, crimson-breasted shrike, malachite kingfisher, fish eagle, gray lourie, scimitar bill, knob-billed duck, crested barbet, and didrio cuckoo. A set (Scott #37 to #39) of three stamps released on October 2, 1967 to mark the International Human Rights Year. The set is inexpensive at under a dollar for MNH or used. It depicts the Human Rights Flame and Arms of Botswana in different designs and denominations. A Food Staples set (Scott #71 to #74) of four stamps released on April 6, 1971. The design shows the crops and farmers. The set catalogs for around a dollar MNH or used. The crops featured are sorghum, a very important crop for the population engaged in sustenance farming, millet, corn, and peanuts. A set (Scott #106 to #109) of four stamps released on May 8 1974 to mark the tenth anniversary of the University of Botswana (Bechuanaland), Lesotho (Basotoland), and Swaziland. The set catalogs for around a dollar MNH or used. The designs were Kwaluseni Campus of Swaziland, Roma Campus of Lesotho, and the maps and flags of Botswana, Lesotho, and Swaziland. The present-day University of Botswana (UB) established in 1982 was rooted from this larger University system, with the aim of reducing their reliance on tertiary education in South Africa. A set (Scott #341 to #344) of four stamps depicting the important minerals of Botswana released on March 19, 1984. The set catalogs for around $15 MNH or Used. The minerals depicted are diamonds, lime, copper, nickel, and coal. A set (Scott #389 to #392) of four stamps in the Flowers of the Okavango Swamps theme released on November 3rd, 1986. The set catalogs for around $15 MNH and around $10 used. The depicted flowers are ludwigia stogonifera, sopubia mannii, commelina diffusa, and hibiscus diversifolius. A set (Scott #655 to #658) of four stamps in the tourism theme released on March 23rd 1998. The set catalogs for around $4 MNH or used. The designs are baobab trees, crocodile, stalactites, and tourists. A set (Scott #757 to #760) of four stamps released on December 1, 2002 in the 2002-2003 AIDS Awareness Campaign theme. The set catalogs for around $5 MNH or used. The simple design inscribes one of the awareness themes: voluntary counseling and testing centers, prevention of mother to child transmission, stigma and discrimination, and orphan care. Also inscribed is Tebelopele, which means looking into the future, is an organization that acts as Botswana’s Voluntary HIV Counseling and Testing Network. This important set marks Botswana’s efforts at containing the pandemic – Botswana has the 2nd highest known rates of HIV infection, just below Swaziland and the impact best summarized by the fact that life expectancy at birth dropped from around 65 to 35 in 2006. Coins $1 and up Common Thebes in UNC start around $1. Silver proofs from the 70s and 80s start around $40. The 1981 Silver Pieforts start around $100 while the Gold Pieforts of the same year go into the 1000s. Commemorative Gold Proofs such as the 1983 Wildlife, 1989 Save the Children Fund, 1976 Independence Anniversary, 1981 International Year of Disabled etc go well into the 100s and 1000s based on bullion value. Paper Money $5 and up Recent UNC banknotes start around $5. Specimen UNCs are the 70s start around $30. Low number banknotes from the 70s and 80s start around $100. Undoubtedly, baskets are the most famous craft product from Botswana - perfected over thousand years some are indeed work of art. Textile and weaving products though amazing may not be wallet-friendly. Original San (bushman) jewelry and leather-work, including miniature items like bows and arrows are popular takeaways. Jewelry $5 and up Botswana Agate earrings, pendants, rings, and other jewelry start around $5 and can go all the way up to the 100s depending on color, size, polish, and rarity.